Peterson May Join Elite Running Backs on Monday Night - Fantasy Football, Fantasy Football Rankings | Mac Bros. In just his fourth NFL season, Vikings running back ADRIAN PETERSON has already posted rushing numbers amassed by few others in league history. On Monday night, when the Vikings visit the Jets (ESPN, 8:30 PM ET), Peterson (a fantasy football points machine) will look to add to his accomplishments. Selected in the first round of the 2007 NFL Draft (No. 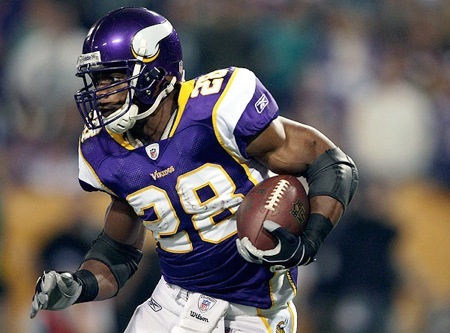 7 overall) out of Oklahoma, Peterson has rushed for 4,876 yards and 43 touchdowns in 49 career games. With 124 rushing yards this week, Peterson can become the fifth player in NFL history to reach 5,000 yards in his first 50 career games. So far this season, he is averaging 130.7 rushing yards per game (392 yards, three games), the second-best mark in the league. He can also join elite company and rank in the top five in most rushing yards and rushing TDs in a player’s first 50 NFL games. Peterson, who has 392 rushing yards and three touchdowns in three games this year, will also look to continue two impressive streaks in 2010. Last year, Peterson became the first player since Pro Football Hall of Famer BARRY SANDERS to start the Pro Bowl at running back in each of his first three seasons. He rushed for 1,383 yards and a league-best 18 touchdowns in 2009 and joined Pro Football Hall of Famers EARL CAMPBELL and Sanders as the only players in NFL history to rush for at least 1,300 yards and 10 TDs in each of his first three seasons. With another such season in 2010, Peterson will join Campbell as the only players to accomplish the feat in each of his first four seasons.